Winters does not mean an unhealthy you. Instead, winters give you perfect chance to tone up and up beat your health status and regain your lost energy. 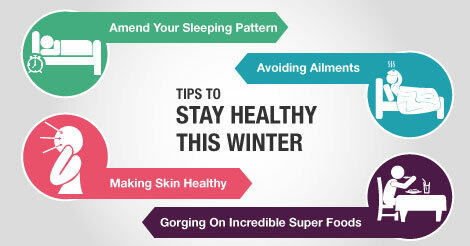 Here are few handy tips to stay healthy and become fitter this winter. According to The Sleep Council, winters are the best time to amend the sleeping pattern. On average, we sleep about 5-6 hours, rather than the recommended 7-8 hours. Cold weathers naturally allow the body to opt for the hibernating patterns and allows us to sleep more if we want to. While you need to take some extra care for your skin, but the efforts can do wonders to your looks. The dry and cold season reduces the oil and sebum production from your skin and can help you to get rid of skin problems like acne, uneven tone, and pimples. Only you need to select right moisturizer according to your skin type and keep your skin nourished. Winters offers you a chance to gorge on a huge range of superfoods. The seasonal fruits like oranges, strawberries, amla, and others are full of vitamin C and anti-oxidants.Likewise, the huge range of green leafy vegetable like methi, spinach, spring onions, dill, and sarso can do wonders to your health and nutritional status. Since food is easily digested during winters, you can include a lot of whole grains like ragi and bajra along with high protein pulses like urad dal, rajma, and beans to your diet on regular basis. These superfoods will not only make you healthier but will also help you to lose those extra pounds as well as boost your immunity. Viral and bacterial infections are very common during winters and mostly affects the respiratory tract. Chances of asthma attacks also increase due to cold winds. It is thus very important to protect yourself by keeping warm, eating right and avoiding contact with infected persons.